Developed out of the Bo.108 Advanced Technology Helicopter programme, the latest Eurocopter EC-135 made its maiden flight at Ottobrun, Munich on 15 February 1994. Built using composite materials, the EC-135 is a modern technology helicopter incorporating the latest in modular cockpit design and Anti-Resonance Isolation Systems etc. The tail-rotor has been replaced with a 10-blade advanced Fenestron and the helicopter incorporates the latest bearingless main rotor system. It can be powered with either Pratt & Whitney 206B, or Turbomeca Arrius 1B1 powerplants managed through a FADEC control system. With an all-up-weight of 2485kg, the EC-135 has a larger cabin area than the Bo.108 and has been designed to accommodate seven adults or five in luxury club seats. Intended to replace the successful Bo.105 series, the EC-135 has been designed for reduced operator costs and to provide ease of maintenance. PROGRAMME: First flight on 15 October 1988 of technology prototype, D-HBOX, previously known as BO 108, powered by two Rolls-Royce 250-C20R turboshafts with conventional tail rotor; new all-composites bearingless tail rotor tested during 1990; Eurocopter announced in January 1991 that BO 108 was to succeed BO 105; first flight of second prototype (D-HBEC) powered by two Turbomeca TM 319-1B Arrius, 5 June 1991; production main and tail rotors flight tested during 1992 in preparation for certification programme; design revised late 1992 to increase maximum seating to seven; advanced Fenestron adopted. Two preproduction prototypes D-HECX and D-HECY made first flights respectively 15 February and 16 April 1994 powered by Turbomeca Arrius 2B and P&WC PW206B intended AS production alternatives; third preproduction prototype (D-HECZ) made first flight 28 November 1994, powered by Arrius 2B, and subsequently made type's US debut at HeliExpo '95 in Las Vegas in January 1995; total flight time of first three preproduction EC 135s was nearly 1,600 hours by end 1996, by which time all three preproduction prototypes had been retired. VFR certification to JAR 27 16 June 1996 and to FAR Pt 27 with Category A provisions and for both engine options, 31 July 1996; IFR certification awarded jointly by DGAC (France) and LBA (Germany) on 9 December 1998, while that for CAA attained late 2000; LBA (JAA) single pilot TFR certification achieved 2 December 1999; certified in 17 countries by June 2000; first two production aircraft delivered to Deutsche Rettungsflugwacht on 31 July 1996. EC 135P1: Pratt & Whitney engine version (PW206B). First two (D-HQQQ and D-HYYY; c/ns 0005 and 0006) delivered on 31 July 1996 to Deutsche Rettungsflugwacht. EC 135P2: Introduced August 2001. FW206B2 engine with improved contingency ratings. EC 135T1: Turbomeca engine version. First (0010/ N4037A) delivered to USA in November 1996. Early helicopters had 435kW Arrius 2B engines, later replaced by 500kW Arrius 2B1. Uprated Arrius 2B1A engine certified April 2001. EC 135T2: Deliveries from September 2002. Arrius 2B2 engines. EC 135 ACT/FHS: Active control technology and flying helicopter simulator; German fly-by-light trials programme; first flight of modified production EC 135 (D-HECV) from Eurocopter's Ottobrunn facility 28 January 2002. EC 135 APH: Advanced Police Helicopter. Unified mission fit offered by McAlpine Helicopters of UK, 1997; allows simple outfitting with sensors and equipment, according to tasking, using underfuselage pod; typical equipment, including loudspeakers, searchlights, microwave downlink and multisensor turret, can be fitted externally; TV and video equipment earned internally. Pod reduces maximum speed by 9km/h. 635T1s on 22 October 1999 for delivery from June 2001. However, these retrospectively cancelled on 14 August 2002, following delay in post-delivery modifications; all sold to Jordan which, in March 2003, increased its order to 16. CUSTOMERS: Announced customers include Boeing Executive Flight Operations (two in mid-2002) plus one option, Bond, UK (15), Deutsche Rettungsftugwacht (German Air Rescue; two); EuropAvia, Switzerland; MFL, France; Helicap of Paris, France (14 EMS versions); Basque Police, Spain; Bavarian Police, Germany (9 with PW206 engines); Sultan of Pahang, Malaysia; Heliair/OAMTC, Austria (five, delivered from 10 August 1997 followed by order for 11 on 27 September 2000 for delivery between December 2000 and early 2002); DAO, Argentina; Laidlaw, UK; Hood, UK; Manichi Press, Japan; Elifriulia, Italy; Proeteus, France; Air Service 51, France; Center for Emergency Medicine of Pittsburgh, Pennsylvania (one); Norsk Luftambulanse (six); Petroleum Helicopters Inc (three); Temsco of Ketchikan, Alaska (one); TexAir of Houston, Texas (one); ADAC, Germany (12 for EMS); Osterman; Swedish Police (seven, first aircraft handed over 10 August 2001) Haier, China (one in VIP configuration); Helicap, France (two, in EMS configuration) of which first delivered 12 September 2002); and Helicsa. Spain (six, in EMS configuration). Law enforcement users include Mecklenburg-West Pomerania, Germany (two), Rheinland-Palatinate, Germany (one, delivered 10 July 2002, plus two options), Saxony Police (one), Abu Dhabi Police (one), Chile Police (one), Greek Police (two), Travis County Police Department, USA (one), plus UK police forces (seven). German Army ordered 15 at cost of DM95 million in August 1997 for delivery in 2000 to replace Alouettc II in training role of which the first was delivered on 13 September 2000. German Border Guard (Bundesgrenzshutz; BGS) ordered nine (subsequently increased to 11) in December 1997; first three delivered 21 September 2000, with eight in service by end of 2001. Eurocopter expecls to win 700 sales out of a world market for 1,350 during the period 1998 to 2007. More than 300 on order by 92 customers � 25 countries by January 2003. 100th delivered (to Bavarian Police) on 16 June 1999, and 250th to Spanish operator CoyotAir on 25 October 2002, some two-thirds with Turbomeca engines; 30 ordered in 1999, 40 in 2000 and 38 in 2001; deliveries totalled 37 in 1999 and 31 in 2000. 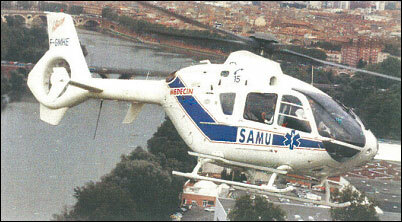 COSTS: Operating cost 25% lower than BO 105; development programme funded by Eurocopter Deutschland and Eurocopter Canada, suppliers, and German Ministries of Economics and Research and Technology; flyaway cost US$2.39 million (1996); programme unit cost DM6.67 million (US$4.4 million), Bavarian police (1996). Portuguese contract for nine valued at �35 million (1999). DESIGN FEATURES: Designed to FAR Pt 27 including Category A and European JAR 27; pod-and-boom configuration, with Fenestron; forward flight stability by two horizontal and four vertical (fin, underfin and two endplates) surfaces; four-blade FVW bearingless main rotor, single-piece rotor head/mast; rotor rpm are variable; composites blades mounted on controlled flexibility composites arms giving flap, lag and pitch-change freedom; control demands transmitted from rods to root of blade by rigid CFRP pitch cuffs; main rotor blades have DM-H3 and -4 aerofoils with non-linear twist and tapered transonic tips; main rotor axis tilted forward 5�. Airframe drag 30% lower than BO 105 by clean and compact external shape; cabin height retained by shallow two-stage transmission; vibration reduced by ARIS mounting between transmission and fuselage; all dynamically loaded components to have 3,500 hours MTBR or be maintained on-condition. Fenestron has 10 asymmetrically spaced blades. Second BO 108 prototype had EFIS-based IFR system; fuselage stretched 15cm and interior cabin width extended by 10cm; main rotor diameter extended to 10.20m; for EC 135, tail rotor replaced in 1992 by New Generation Fenestron with 11 fixed flow-straightening vanes in fan efflux designed to avoid momentum losses and improve fan figure of merit; vanes are swept relative to radius and fan has different number of blades to avoid shocks and reduce noise; fan blade tip speed is only 185m/s; maximum T-O weight increased to 2,720kg. FLYING CONTROLS: Conventional hydraulic fully powered controls with integrated electrical SAS servos; objective is single-pilot IFR with cost-effective stability augmentation. Electric cyclic trim system. STRUCTURE: Airframe mainly Kevlar/CFRP sandwich composites, except aluminium alloy sidewalls, pod lower module and cabin floor, tailboom and around cargo area; some titanium in engine bay; composites tailplane. LANDING GEAR: Skid type; ground handling wheels can be fitted. POWER PLANT: Choice of turboshaft engines. Turbomeca-engined aircraft have two Arrius 2B2s, each giving 452kW at T-O, 426kW maximum continuous, 528kW OEI continuous, 580kW for 2 minutes with OEI and 609kW for 30 seconds. Alternative power plant is two Pratt & Whitney Canada PW206B2s, each giving 463kW at T-O, 419kW maximum continuous, 528kW OEI continuous, 580kW for 2 minutes with OEI and 609kW for 30 seconds. Both types of engine have FADEC. Transmission rating 616kW maximum T-O, 567�W maximum continuous, 353kW OEI continuous, 513kW for 2 minutes with OEI and 526kW for 30 seconds. Fuel capacity of first 249 aircraft 673 litres of which 663 litres are usable. Capacity 700 litres from No. 250. Additional long-range tank optional, usable capacity 198.5 litres. Optional self-sealing fuel tanks. Oil capacity 8 litres. ACCOMMODATION: Seven persons, including one or two pilots, in standard version, or six persons in VIP version; optional max capacity of eight. Four-point harnesses for front seats; three-point harnesses for remaining seats. Forward-hinged doors for two front occupants; sliding doors for five persons in cabin. Rear of pod has clamshell doors for bulky items/cargo; flights permissible with clamshell doors removed; optional window in each rear door. Unobstructed cabin interior. EMS variant can accommodate one pilot with two stretcher cases and two seated medical staff/ attendants; alternative layouts for one, one, three, or two, one, three, or two, two, two. SYSTEMS: Redundant 28V DC electrical supply systems to JAR/FAR 27 standards; two 160A 28V starter/generators and 24V 17Ah Ni/Cd batteries in Arrius 2B variant, two 200A 28V starter/generators and 24V 25Ah Ni/Cd batteries in PW206B variant. Fully redundant dual hydraulic systems. NATO standard external power connector. AVIONICS: Bendix/King Gold Crown and Thales equipment. Total of 10 standard avionics and equipment packages available. Radar: Provision for integrated weather radar. Flight: Air data computer; SFIM automatic flight control system (AFCS); GPS. Honeywell combined solid-state flight data and cockpit voice recorder tested on EC 135 late 1998. BGS aircraft have EADS-Dornier Hellas obstacle warning system. Optional Bendix/King Mark ��� EGPWS available for EC 135 APH. Instrumentation: Liquid crystal dual-screen (Thales SMD45) vehicle and engine management displays with AN equipment. Mission: Optional FLIR and NVGs for military, police and ambulance roles. BGS EC 135s are first to be equipped with Hellas laser obstacle warning system. EQUIPMENT: Options include cargo hook, external loudspeakers and searchlights, rescue winch (230kg) with 50m cable, emergency floats, sand filter, wire-strike protection system and light armour protection. ARMAMENT: EC 635 undergoing testing with FN Herstal HMP 400 12.7mm machine gun, Giat NC621 20mm gun and 12-round 70mm rocket launcher. What is the length of the skid? pls send example of neumerical about helicaptor fan blade desined in my id. Instead of converting the UH 72 Lakota to an armed scout, EADS should offer the EC 635. They could offer bigger engines then the current P W 206, to make up for the heavy Fenestron tail and meet the US Army requirements. Can anyone tell me what exactly the "Heckauslegerbeschlag" is? Would "tail boom fitting" be an acceptable translation? EC135 can hold 7 VIPS or a Streacher. Any body know the brand & model of the connectors interphones? The connectors have 8 pins (7 in circular distribution and 1in the middle). The circle diam is arrond 12 mm and the body is arround 15 mm. The connector is push-pull tipe (no has key or turn to locate. When plug-in the connector a click is hearing and to remove, pull the esternal body an then the connector is release. Thank you, very much. Best regards. This aircraft can operate in navy ships? Which limits of roll and pitch ship motions can tolerate? I am concern about its rigid rotor and the gyroscope effects in taking off and landing. Thank you very much. TO Which load factor does external equipment (whip antenna) is designed. I, too, am looking for design information for helipad - distribution of skid loads fore / aft. I am looking for design information for helipad - distribution of skid loads fore / aft. What about the cabin interior loads in civil version. I want to know something about the Handling loads in the VIP/VVIP cabin interiors other the the Aerodynamic loads. Can you please reply for the same. what is the length of the skid landing gear on the ec135 which comes in contact with the ground? I would like to be in contact with your research and development department. Please forward me a contact name or email at your earliest convenience. � Having aimed to build 30 EC 135s in 1997, Eurocopter expects to increase production to 60 per annum thereafter. � Eurocopter foresees a requirement for 700 EC 135s up to 2007. � A number of EC 135s were flying with police forces in Germany and Spain by early 1997. 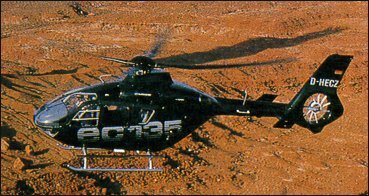 � The McDonnell Douglas MD 900 Explorer is a serious EC 135 competitor. � Operating costs of the EC 135 are 25% below those of the BO 105.